With 2019 upon us, it’s time to examine the furniture and design trends that are shaping the look of home décor. A few 2018 styles will stay with us through 2019 and remain strong, while many design trends we’ve see in past decades are returning as more designers look to infuse the personality of their clients into their living areas. But through it all, modern-contemporary designs continue to grow in popularity and promise to be with us for some time to come. Here are a few trends that I believe are worth watching for 2019. While high-tech designs were big in 2018, many of our clients have been seeking more natural looking materials in their homes. Stone, wood and even concrete are all on-trend in 2019. We’ve seeing a return to retro colors and shapes, particularly those from the ’1960s and ’70s. Some of this retro styling is showing up in the form of low, curved throwback furniture and fabrics that are rich in texture and detail. ‘Boho Chic’ remains quite popular and fits in perfectly with emerging retro trends. With the rise in Millennial’s seeking-out urban living so has the demand for flexible furniture that serves more than one purpose, takes up less space and is easy to move. Expandable tables, fold-out movable bars and modular sofas are just a few of the furniture pieces whose popularity will continue to grow in the coming months. These are perfect solutions for those with small apartments or tight living quarters. It also appeals to people embracing minimalism and clean lines in smaller, more affordable homes. Despite a move toward smaller living spaces, many people still enjoy the look of luxury and glamour in their homes and apartments. This has created a renewed interest in Art Deco design, which I believe will become quite popular in 2019. 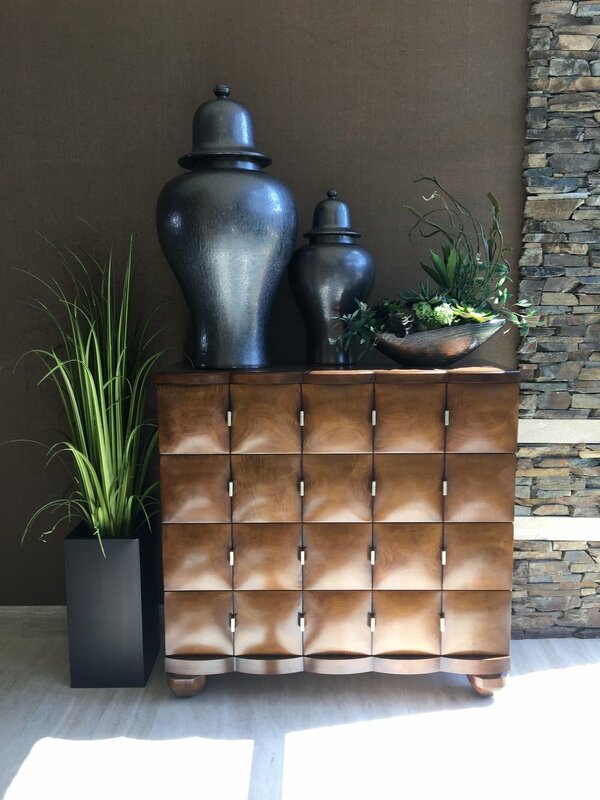 Metal of all types and colors will continue to be a prominent feature in 2019 interiors, especially in fixtures, furniture, and accent pieces. The primary difference this year will be an increase in the use of copper, brass, and blackened metals although polished nickel and stainless steel will likely remain as tried and true favorites. I can say with complete confidence that a great many of my clients list their bed among their favorite furniture items in their home. More than just a place to sleep, a bed provides a sense of comfort and safety, thus creating the ultimate oasis for relaxation. At Furniture Market we continue to see more beds featuring plush headboards and footboards covered in comfortable upholstery. 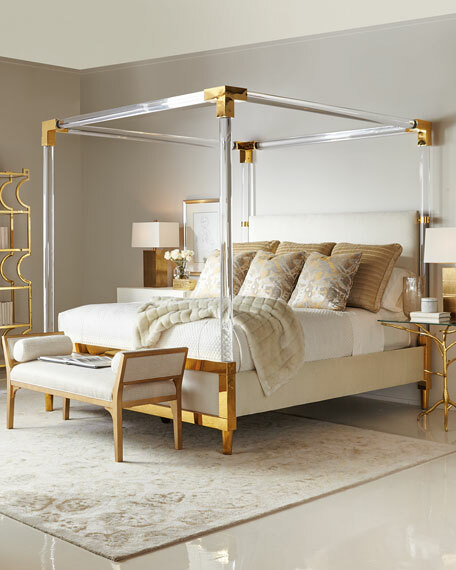 Canopy beds which were the rage just a few years ago in the ‘Tuscan-era’, have been growing in popularity again as the trend toward cozier bedrooms continues to grow. Gone are the massive wood posts and chunky ornate headboards, being replaced with modern sleeker materials such as clear acrylics and finished metals. Although light blushes and timeless black and white furnishings are still in style, many furniture designers, including the prestigious European manufacturers are getting more adventurous with their color choices. In 2019 we’ll see greater use of more bold colors such as deep greens, striking yellows, brunt orange and tonal reds. In the last decade the demand for more eco-friendly and sustainable products has emerged in many industries, including home furnishings. Buyers are looking to see the products they purchase last longer and less ‘use and dispose’. 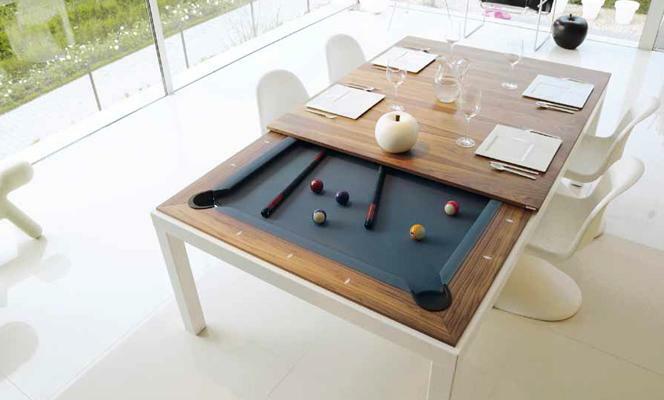 This concept makes quality high-end furniture more attractive and more long-term affordable than it did in the past. We approach each challenge the same way, “it’s really all about the client.” People who know us come to Furniture Market because of our reputation for high-end luxury furniture and expert interior designers. Some visit the showroom just to catch an inspirational vibe. They come looking for a creative experience that will both inspire and inform them on their home furnishing project. Naturally if they want to just buy a chair, sofa or bed they can do that, but it’s not usually the type of store traffic we get. More often we are seeing people who are embarking on a new room design or they are having a new luxury home built and want the entire home furnished and don’t know where to start. In the case of the later we can take care of everything by working with the owner and their architect to ensure that home conforms to the furnishing theme and vise-versa. Visitors to Furniture Market also come to the showroom to find accessories and the latest art pieces, things that they would not be able to find anywhere else. That is just one the things that makes Furniture Market unique. Every item in the store has been carefully selected to be thought-provoking, visually creative and unique. People often come to me to push the envelope within their genre, to discover their taste and style and transform it into a livable, functional home design. We just don’t fill spaces with attractive furniture or place a sofa in a certain spot because it will fit that sofa. On the contrary, for every piece we place in every room there must be reason why its there. It’s placement within the room must complete ‘the story and feel of the design’ as well as play off the design of the home and the natural light available. I believe it’s our commitment to the art of interior design as well as the client that keeps them coming back and referring us to their friends. What are you paying for in a chair? Investing money in fine furniture is a big deal and It’s important to know what you’re paying for. When it comes to a piece of furniture that you’ll have in your house for decades, you’ll want to know that you are paying for something that will not only be a joy to sit in but will also be well-made and built to last. 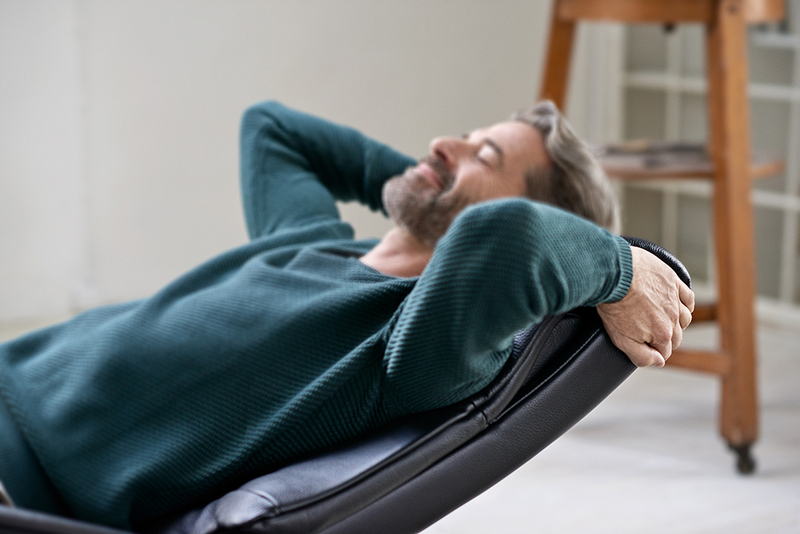 Stressless focuses foremost on quality; in both material and construction. 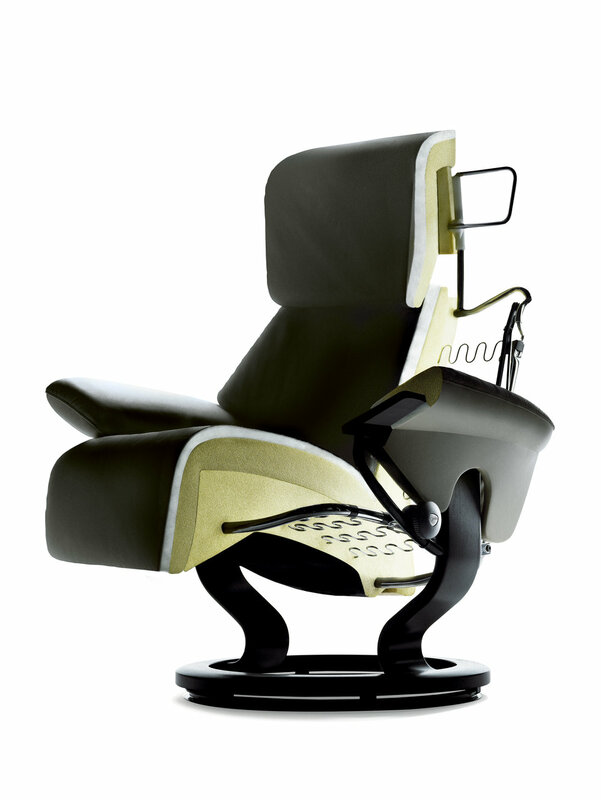 Stressless pays attention to every detail, from the several layers of specialty foam to the fabric and leather. For example, they mold perforated foam directly over the base, enabling you to sink deeply into the chair. Unlike most chair manufacturers, Stressless uses a solid steel rod base that is cold bent for form the frame. This is a special process that creates more durability and support that lasts longer, a process that most manufacturers find too complex and expensive. When it comes to coverings, they only use top-grain leather, which they source and hand-select from the finest tanneries in Italy and Brazil. Every step in the construction process is carefully designed to produce furniture that is of the highest quality and extremely durable. Many in the furniture industry compare just how far Stressless will go to create the most comfortable chair possible to that of luxury automobile make Rolls Royce. There are just no short-cuts taken! The bottom line is this, a Stressless chair or sofa must be comfortable and it has to last. It could very well be the last chair you’ll ever buy. That is what you’re paying for.